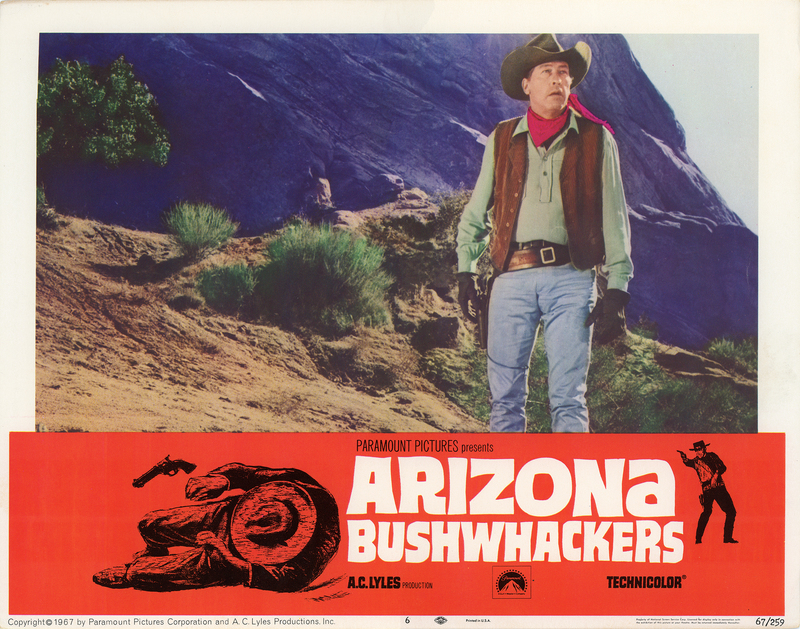 SCVHistory.com LW3107 | Vasquez Rocks | Lobby Card: Arizona Bushwhackers (Paramount 1968). Vasquez Rocks seem to confuse 1950s movie musical star Howard Keel ("Show Boat," "Kiss Me Kate") in this 11x14-inch lobby card advertising the 1968 Paramount feature, "Arizona Bushwhackers," from veteran producer A.C. Lyles, whose Santa Clarita Valley credits stretch from the TV series "Rawhide" in 1959 to "Deadwood" in 2005-2006. "Arizona Bushwhackers" also used other SCV locations as well as Red Rock Canyon State Park in the Mojave Desert. Future Vasquez Rocks neighbor Montie Montana drives a stagecoach and Honby stuntman Jack Lilley is a townsman in this film, which also features Yvonne De Carlo ("The Munsters"), John Ireland, Marilyn Maxwell, Scott Brady, Brian Donlevy, Barton MacLane, James Craig, Roy Rogers Jr., Regis Parton and Eric Cody. Uncredited cast includes Rex Andrews, Danny Borzage, Paul Bradley, Bob Burrows, James Cagney (narrator), Tom Collins, Gene Coogan, Joe Garcio, Rod McGaughy and Phil Schumacher. LW3107: 9600 dpi jpeg from original lobby card purchased 2017 by Leon Worden.